Tropical amphibians that superficially resemble earthworms or snakes as they completely lack limbs. They are burrowing animals, as evidenced by their wedge-shaped heads and blunt tails, and spend much of their time underground. These are small animals that superficially resemble lizards but are smooth-skinned and may live both on land and in water. Some species of salamander are completely aquatic, some burrow, many are terrestrial and many others are arboreal, living in the forest canopy. "Salamander" is the common name for the clade Caudata which includes 9 families. The term "Newt" is sometimes used to describe relatively small salamanders. The term "Siren" is used to describe aquatic salamanders which lack hind limbs. These amphibians are unlike other vertebrates in having robust, tailless bodies with no obvious neck and well developed limbs. The hind legs are typically nearly twice the length of the body. Not all anurans hop, some walk and others are completely aquatic and use their legs to propel themselves through the water. Hind legs are long and strong, adapted for leaping and swimming, skin is smooth and slimy and eyes bulge. - Most commonly found near water. 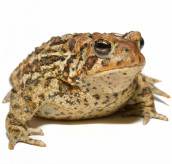 Warty and dry skin with large bodies and stubby legs adapted for walking. - Most commonly found on land. Like the anurans, these animals are very distinctive. The body is encased within upper and lower bony shells (carapace and plastron, respectively) known as the shell. British: Sea-dwelling aquatic Cheleonian, only ventures on to land to lay eggs (Sea Turtles). American: Aquatic or semi-aquatic chelonian, may live in sea or fresh water but ventures on to land to bask (often interchangeable with terrapin). Sometimes describes land-dwelling chelonians (Box Turtle). British: A freshwater or brackish-water aquatic chelonian. American: Often used to describe brackish water aquatic chelonians. Interestingly, crocodilians and birds are closely related, both being living examples of Archosaurs. Crocodilians are semi-aquatic, predatory reptiles with armoured skin and powerful tails and limbs. The limbs allow mobility on land although terrestrial activities are usually restricted to basking and nesting. The upper jaw is not as broad as the Alligators. The 4th tooth back from the front on the lower jaw is greatly enlarged. The tip of this tooth is clearly visible. Broad snouted ("shovel shaped"). Teeth aren't as obvious as with Crocodiles, the largest tooth fits into a socket so the tip is hidden. Alligators are divided amongst four genera (Alligator, Caiman, Melanosuchus, Palpebrosus). The American Alligator is the most well-known. Greatly elongated snout specialised for eating fish. Comprises of the lizards, snakes and amphisbaenians. They are the most diverse and species rich group of reptiles, occupying habitats ranging from tropical oceans to temperate mountaintops. Both snakes and amphisbaenians are descended from lizards. The term lizard is applied to any squamate that isn't a snake or amphisbaenian, this group is highly diverse. There are approximately 4,500 species of lizard. Unlike snakes, lizards typically have four legs (with the exception of legless lizards) and external ears. Many species of lizard can detach their tail if threatened by a predator. Snakes are carnivorous, legless reptiles with elongated bodies and belong to the suborder: Serpentes. They can be distinguished from the legless lizards by their lack of eyelids and external ears. Snakes are capable of swallowing prey much larger than their heads due to a highly mobile jaw. The mandible is not fused at the front so the snake can move the left side and right side of the jaw independently. Snakes do not dislocate their jaws. Most amphisbaenians are elongated with short stubby tails, scales arranged in rings around the body and are limbless (with the exception of Bipes, which has two mole-like front limbs). These reptiles resemble most lizards but diverged early from the squamates and are now part of a distinct lineage, order Rhynchocephalia, endemic to New Zealand. The tuatara flourished around 200 million years ago, but in modern times there are only two extant species of tuatara (Sphenodon punctatus and Sphenodon guntheri) making them 'living fossils'. Vitt, L. and Caldwell, J., 2014. Herpetology: An Introductory Biology of Amphibians and Reptiles (4th Edition). Elsevier.